Submitted by Dan Frost on 11 August 2012. A lot has happened in the past 48 hours. I last checked in at the closing of Aug. 8 thinking that all was buttoned up neatly. Field work done, heading out on Friday…pack things up and cast off. Well, later on Wednesday night (post journal) we got a message from UNIS logistics. 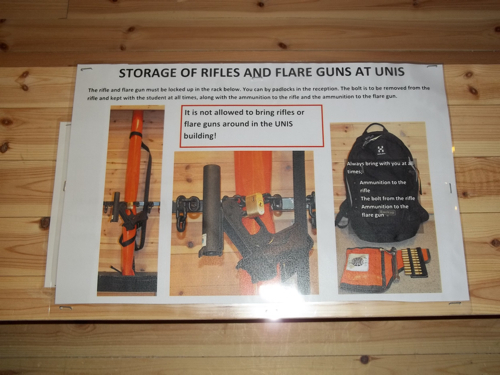 The logistics department is responsible for ensuring that research teams get to where they are going from the University Centre (UNIS), have all of the gear they need, and make it safely back. 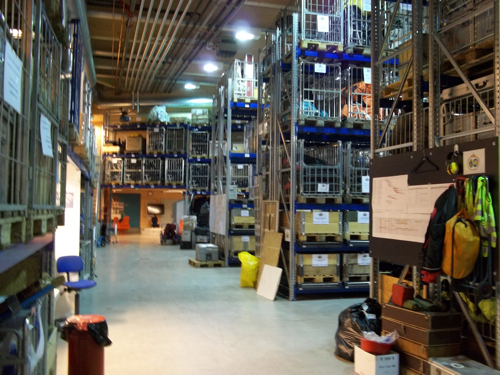 The 'warehouse' room that logistics occupies is completely filled with survival suits, glacier rescue kits, rooms with motors and rifles, and science gear for any purpose under the sun (or ice/water) stacked high to the ceiling on neatly labeled palettes. 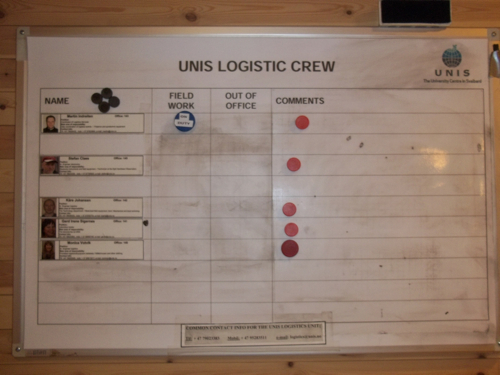 What the inside of UNIS logistics looks like. Gear, lots of gear. Every researcher has to have their own set of plans and gear inventories but it is the folks at logistics that make sure the rubber hits the road. They deal with the reality of situations whether it be bad weather or bad spark plugs when us scientists have our main focus on making sure our excel files are filled with data. Back in the Canadian arctic the logistics folks referred to us lovingly as 'beakers' and had signs and arrows saying where we were allowed and encouraged to be in the warehouse, out of harms way (or creating it). Anyway, back to the story at hand. Our message from UNIS was that we'd need to be in touch first thing Thursday morning because the weather forecast called for high winds on Friday continued through the weekend. This meant that rough seas could possibly bungle our plans to get back to Longyearbyen. We'd planned on having the weekend to sort gear and allow students to prepare their presentations before our last major meetings on Monday and then the 4:30 am flight out on Tuesday. With winds through the weekend that could mean being stranded at Kapp Linne until quite close to our departure date. Winds were projected to be between 6 and 10 meters per second (can you guestimate that in mph?) but from the south. Any east or west winds would have drastically worse implications given the orientation of Isfjord but a south wind could be skirted by the lee of the land. Boats can travel close to the south shore for just about the whole way back to Longyearbyen if the winds aren't much over 8 m/s but we'd just have to wait and see. Among other potential possibilities, one included us catching evening boats back on Thursday (remember, light has been no issue). Having been stranded in the arctic before, I know that you must be flexible and are at mercy of the weather but if you find an opening, you'd better take it. So, we made sure after dinner that the science gear/garage was organized and everyone could evacuate their rooms if we needed to move quickly. Fast forward to Thursday morning (yes, after a month of blogging I've found no better way to transition hours of time in web-speak). 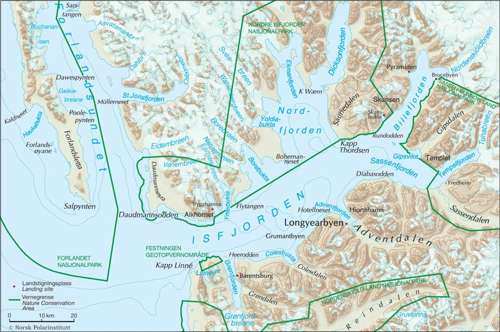 Map of Isfjord from Longyear to Kapp Linne. Note the east-west orientation of the fjord and extremely long fetch if the winds pick up. One slick mooring of temp. probes. Oooohhh, nice knots and zip ties! Dagmar and Louise then donned the survival suits and headed out to the middle of Tunsjoen. Luckily, Tunsjoen is a very shallow lake (1.5 meters at the deepest) so we didn't need to use the boat and get blown all over the place for what should be a fairly straight forward task. With the mooring in, we officially ended field work, packed things up, and headed for our last delicious dinner at Isfjord Radio. 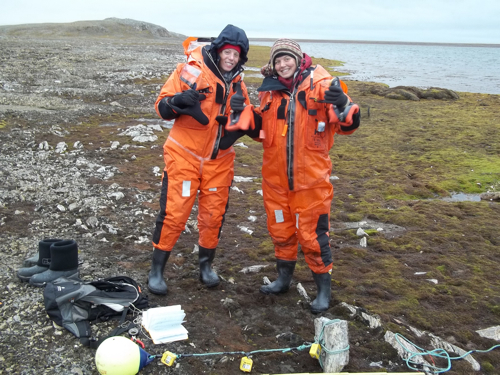 Louise and Dagmar very happy to be finishing their field work. 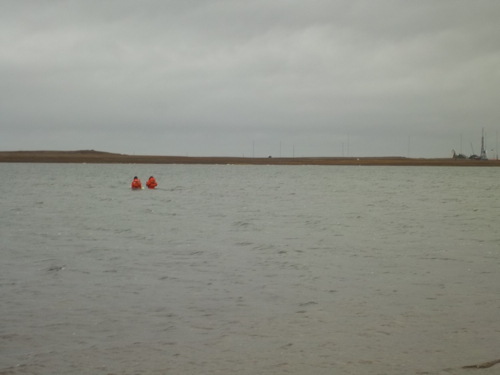 Hence, they were excited before heading into the middle of an arctic lake on foot. Louise and Dagmar in the middle of Tunsjoen. Me, I was psyched to be on the sides taking pictures. 6:00 am, time to get up, time to move. Some of my friends here hate transitions to and from field camp: packing things up, organizing gear, rushing to make sure you make the boat…I love it. The last morning at Isfjord Radio consisted of the typical breakfast, a typical lunch, and then a not so typical move. 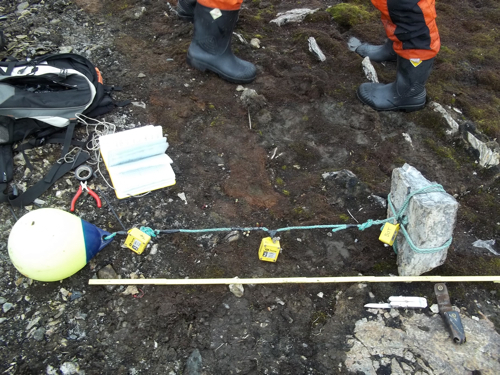 It was decided that Mike, Sara, and I would accompany all of the science gear on one of the smaller boats (similar to what we took out) back to Longyearbyen at 9:30 am. The rest of the group would take off later on a much larger vessel that was transporting a group of biologists to Kapp Linne from the north. The students, Steve, and Hanne's ride back to Longyear. My apologies but I didn't take one photo on the day of Aug. 10 so there is no documentation, only my word. Now surpassing 2,500 photos I think a day of not being a 'shutterbug' was healthy. With the students all helping, we met the boat at the dock at 9:20 and loaded the gear swiftly. Before we knew it Mike, Sara, and I were in survival suits and cruising our way east. The way was choppy at first but as soon as we got more inland the seas calmed down considerably. There was a thick fog in spots then the sky would open and sun would shine down on beautiful sections of coastal terraces covered with moss, lichens, and boulders with exposed cliffs and birds swooping inches across the water for 360 degrees. It was a ride to sit back, wonder how the heck you got there, and take it all in. We made Longyear in good time and spent the afternoon unloading the boat, shuttling gear back to UNIS logistics, and cursing those whose projects culminated in large duct taped boxes full of rocks (Mel!…just kidding, it's fine : ) ). Once gear was all set and we had an idea when the others would be coming into port we said goodbye to Sara and rounded up a few vans to complete the transport. 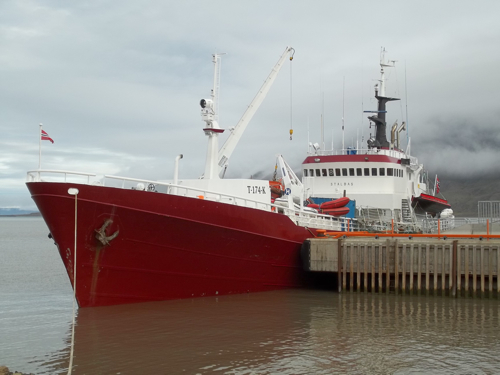 At around 8:15 pm, the large boat with our cohorts arrived into port and parked right next to the only ice-breaker in Svalbard. 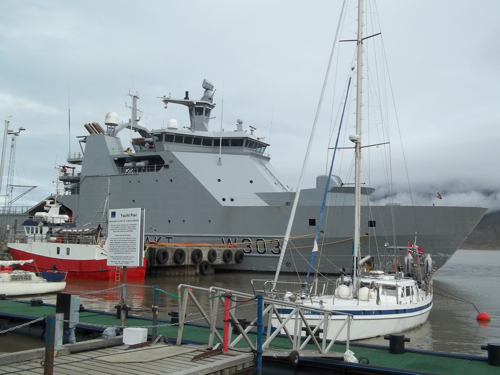 This coast-guard boat is truly impressive and looks like a force to be reckoned with. Though not military in its main purpose, it is decorated/designed like the small town police cars back in Maine for full intimidation factor (yes, Farmington PD, that is a shout out, I will continue to smile and wave going through town). In all seriousness though, it is capable of breaking through some 4 meters of ice as Ole Humlum informed us (he was there waiting to pick up Hanne). 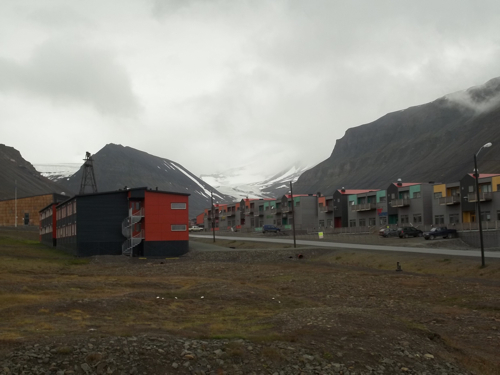 My blue and orange home in Longyearbyen, UNIS guest house. Check out Longyearbreen and the higher elevation snow line than at the beginning of the field season. I like having a glacier in the back yard.